Renowned 20th century inventor and designer Buckminster Fuller once famously said: "When I am working on a problem, I never think about beauty. But when I have finished, if the solution is not beautiful, I know it is wrong." Evoking the same sentiment, iconic pop artist Andy Warhol once declared, "Business is the most fascinating kind of art." In today's modern entrepreneurial ecosystem where a number of over-worked, hyper-functioning people don't take time to smell the roses, viewing one's business as a work of art may be the answer to visionary commitment. 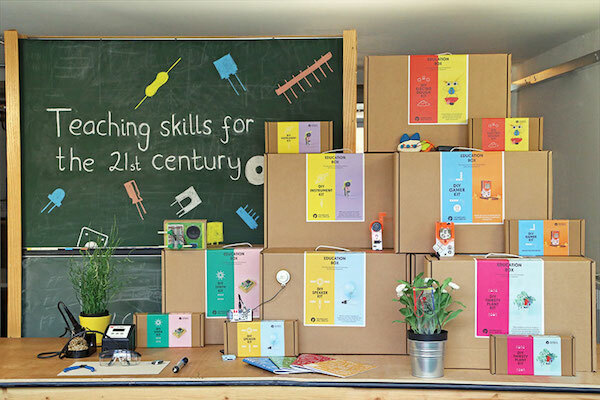 This approach is what keeps Bethany Koby, CEO of the London-based creator of educational DIY kits, Technology Will Save Us (TWSU), happily on point. A former designer, Koby started (TWSU) in her living room two years ago. Since then, the company has gained global appeal. To date, TWSU has sold 28,000 kits in 34 countries. Each kit is designed to encourage kids to make, play, code and invent with technology. What's the team's secret sauce? Building the ideas for each kit around popular hobbies including music, gardening, cycling and gaming. This cross-pollination aligns with TWSU's ways of infusing balance and passion into the entire TWSU experience. From company culture to design and execution, it's the impetus for expansion. "Starting a business is one of the most creative things I have ever done," says Koby. Designing and creating the products and experiences for our customers is only the beginning. We are shaping and creating the foundations for a future to thrive in our business. We're developing rituals we as a team use to stay focused, be inspired and live full lives. This involves balancing data with intuition, emergence with structure, and aesthetics with experience. This creative process feels like art making to me. Part of this artistic flow is complimented by the company's focus on human-centered design when conceiving and producing products. The TWSU team designs kits with and for young people and families. In doing this they typically follow two types of design. One of these is iterative user-centered design, which includes users in the design of existing kits and experiences. The intention is to constantly create more delightful, successful and fulfilling making experiences for consumers. Another common design method of TWSU comes into play when the company works with existing and new users to understand bigger, "everyday" themes around making, as well as everyday life activities to inform new kit development. Promoting STEAM (science, technology, engineering, art and math) skills through hands-on educational activities and modern invention has been steadily proliferating the edtech space for the last four years. In 2011, the electronic module making company LittleBits launched with a 10-piece kit allowing anyone to prototype, build and innovate with electronics. Today, the company features more than five kits, including a Synth Kit for music and a Smart Home Kit for tapping into the ubiquitous Internet of Things, as well as 67 interoperable modules with products sold in 70 countries. The toy company Goldieblox launched in 2012 to develop early interest in engineering and problem solving among girls. From action figures to games to construction kits, GoldieBlox products combine storytelling and mechanical projects aimed to empower girls to create. While TWSU promotes STEAM, it differs from both of the aforementioned businesses in that it provides gadgets that young people can make and code themselves. "When developing the DIY Gamer Kit, we were funded by NESTA, Mozilla and Nominet Trust to gather insights from 300 hundred young people in nine regions around the UK," says Koby. We spoke to them about what skills they had, what skills they wanted to learn, what they were making in school, and what were their passions and hobbies. We knew that young people enjoyed playing games, but what came out was their passion for making games, so we wanted to create a product that allowed them to not only design and code their own games, but also build the console you could play it on. Throughout this process, TWSU revisited the origins of gaming to find an archetype that would inform the gaming kit's design. Kolby says the desirability and design intention of the kits are as important as the functionality and learning outcomes. "We want to design gadgets that feel less homogenous than other consumer technology, but are iconic and functional so they can live in your life alongside your iPhone and laptop," shares Koby. "We intentionally design kits to be elegant, gender neutral, and accessible to the everyday person." At the core of TWSU is the quest to get to the heart of what it means to be human and and mindful of nurturing one's creative powers. And there's nothing more human than art, or in Koby's case, building a company. This post was originally published on The Toolbox, an initiative connecting developers and activists to facilitate solutions focused on human-centered design.